Chocolate rarely disappoints me. Sometimes, when I eat certain brands that were alright in the past, I expect satisfaction for my chocolate craving, but end up being turned off because old favorites now taste too sweet. I used to love Reese’s Peanut Butter Cups, but they just don’t taste as good as they used to. Maybe my taste buds have changed, but give me a piece of Dove dark chocolate, or Cadbury dark chocolate, and I am in confection heaven. Sadly, chocolate straddles the line between healthy and unhealthy – the sugar content necessary to overcome chocolate’s natural bitterness. I remember finding a bar of baking chocolate in our pantry when I was little, and thought my mother was hoarding her own private stash. After chomping a generous bite, my glee quickly turned to disgust as I spit it out, nearly retching. Adding insult to injury was my mother discovering me in that moment and laughing at my misery while telling me it served me right. I’ve always hated the generic chocolate I’d get on Easter, or Valentine’s Day. That chocolate has a somewhat waxy, and almost chemical taste that I no longer find palatable. Interestingly enough though, I also don’t favor high-end chocolates like Godiva, or some others. 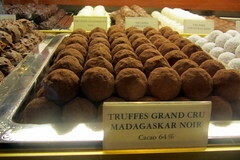 I have never found them superior to some mid-level chocolatiers, but I did enjoy the chocolate I ate in Switzerland. I especially enjoy what a friend and I affectionately term ‘lint-balls’: Lindt, Lindor, chocolates. I prefer dark chocolate, but there are some milk chocolates I’ve had over the years that are wonderful as well, and I regularly have some form of chocolate in my house. I have much better control over my chocolate consumption than I do alcohol, so I allow myself to purchase several bars when there’s a good sale. I don’t get high from chocolate, and I usually get satiated without being excessive. Maybe there is a kind of ephemeral high associated with chocolate because it nearly always helps ease my crankiness associated with PMS, and was one of the (literally and figuratively) sweet things an old boyfriend would buy me once a month. If I’m going to have a piece of chocolate I want something good. Saturday was my husband’s birthday and I made a homemade spelt chocolate cake topped with chocolate ganache. Yummy. We are in Williamsburg, Va. now visiting a friend and I brought 1/2 of the cake with me. She just finished polishing off the rest of it right before I read your blog. My favorite is dark chocolate with orange or raspberry .